Karnataka elections 2018: More votes, fewer seats – how? The BJP has emerged as the single largest party in the Karnataka Assembly elections, with 104 seats out of 222, but it is not the party with the highest vote share. That is the Congress, which has won just 78 seats, that has a higher vote share — 38%, or 1.8 percentage points higher than the BJP’s 36.2%. What explains this mismatch? An analysis of the data shows several pointers. Many of the Congress votes went in seats in which it finished second — in 80% of the 104 seats won by the BJP, and in 68% of the 37 seats won by the JD(S). In the 109 seats in which the Congress was second, the average number of votes it polled was as high as 63,549. Polling trends varied from region to region, some of these serving as a pointer to the mismatch between votes polled and seats won. Unlike Gujarat, which saw a clear urban-rural divide with the BJP dominating the urban belt, the Karnataka capital was closely fought. The BJP won 11 seats, the Congress 13 and the JD(S) 2. Here, the BJP had a slightly higher vote count (average 72,840) than the Congress (70,608). The BJP held on to traditional votes in Bengaluru South. 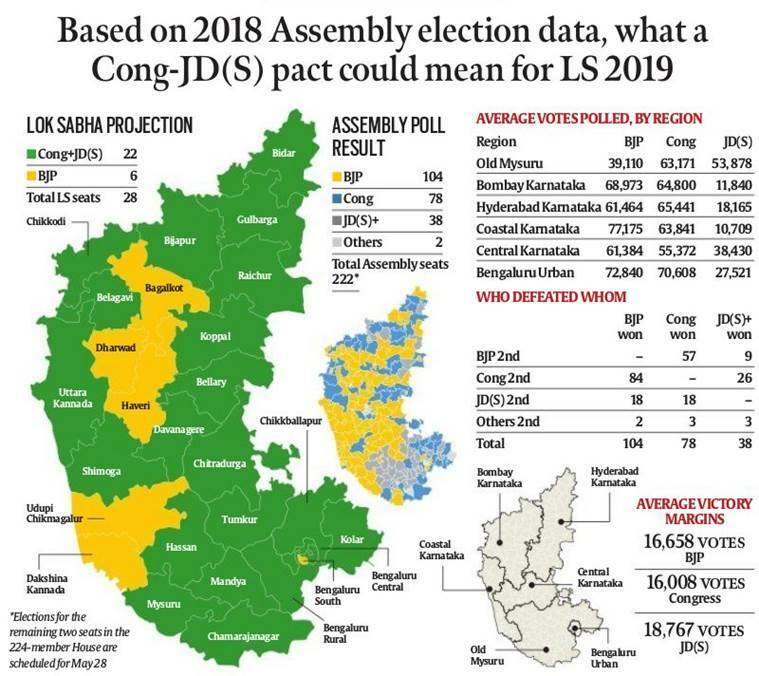 If the same results were projected to the Lok Sabha elections, the BJP would be set to lose Bengaluru North and Bengaluru Central. The Congress bagged a far higher vote share and half the seats in this region of 41 seats. In the last leg of selection, the BJP decided to give tickets to the Reddy brothers of Bellary and their associates. The BJP won just 15 seats in the region, which has a significant Telugu-speaking population. The average votes polled by the Congress, 65,441, was 4,000 more than the BJP’s 61,464. The Congress tally of 21 was short of its 23 in 2013, while the JD(S) took away four seats despite averaging 18,165 votes per seat. In this Lingayat stronghold, the BJP won 26 seats, doubling its 2013 tally of 13 (the Congress had swept the region then, winning 30 seats). This time it was the Congress that secured just 13 seats, indicating that the Lingayat community has rejected former Chief Minister Siddaramaiah’s move to give them minority religion status. This region too witnessed a two-way contest, with the BJP averaging 68,973 votes, the Congress 64,800 votes, and the JD(S) 11,840. Here, the BJP regained the ground it had lost the last time, winning 16 seats, averaging 77,175 votes per seat. The Congress won the remaining three, down from the 13 it had won in the previous elections, with an average of 63,841 votes per seat. The JD(S) averaged just 10,709 votes in the two-party contest. The southern Karnataka region, the largest, was the mostly keenly contested. The BJP won 16 seats, the Congress 20, and the JD(S) 25. The JD(S) tally suggested a consolidation of the Vokkaliga vote in its favour and a split in the traditional Congress vote. Although the JD(S) won the highest number of seats, its average of 53,878 votes was lower than the Congress’s 63,171. The BJP average was 39,110 votes. The region threw up some surprises, with Chief Minister Siddaramaiah losing from Chamundeshwari constituency and BJP candidate Preetham Gowda winning from Hassan, the home constituency of former Prime Minister H D Deve Gowda.